Up for sale is the Panasonic PT-VW330U Projector. Sale is "As Is No Warranty". The PT-VW330U projector also includes a wide array of features including a 10W speaker and microphone input for audio playback directly from the projector, a built-in closed caption decoder and a carrying bag with a handy shoulder strap. Only includes projector with lens cap and power cord. Remote and manual can be found online for cheap. Panasonic PT-F200U LCD Projector 3500 LUMENS "C"
Panasonic PT-F300 Projector. _gsrx_vers_841 (GS 7.0.16 (841)). This Panasonic PT-LB60U 3LCD Projector is in good physical condition except for minor scratches/scuffs and sticker residue from normal use. See photos for more details. During the testing process the total lamp hours used were found to be 926 hours. Panasonic PT-FW300U LCD Projector. 3 HDMI to DVI Adapter. Is used to connect this Projector to HDMI. We found the best quality/price option. We will provide you with the best Adapter for this projector. 1920x1200 WUXGA Native Resolution, 16:10 Widescreen Aspect ratio (4:3 and 16:9 compatible). Panasonic PT-DZ570 DLP Projector. 1x HDMI Input - can be used with any device that uses HDMI. Projector testing details. Panasonic PT-FW300NT WXGA. It has been tested and is working. Panasonic PT-L501U LCD Projector *Good Bulb*! Up for sale is a used Panasonic PT-L730NTU LCD Projector. Projector has been tested and verified to be in good working order and projects a nice image. Bulb counter shows 519 hours. Power cord and case are included. Tested for full functionality. R2/Ready for Reuse. Includes only what is pictured. Projector has been run from us for 1 hours with the installed new lamp to ensure full working condition. All functions operate as expected. There are no issues with the projector. Panasonic PT-LB51 LCD Projector. The 2x optical zoom lens provides a wide throw range, and the image can be shifted ±65% vertically and ±26% horizontally. This outstanding level of setup flexibility lets you enjoy large-screen viewing in different-sized rooms. Condition is Used. Powers up no problem. This projector is tested and work properly. There is no remote; it is sold as pictured. XGA 1024 X 768 Native resolution. Native Resolution: XGA (1024x768). Panasonic PT-D5600UL DLP Digital Projector. Technology: DLP Projector. Manufacturer: Panasonic. 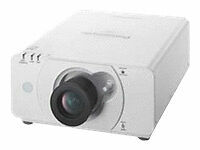 Projector Model: PT-D5600U. The projector is refurbished to its original working condition. ⦁ HD Video Mode: 1080i. Panasonic PT-LC76U LCD Projector. Audio may not be supported. ⦁ Projector Weight: 4.8 lb. Professionally-Refurbished Projector in Perfect/Excellent Working Condition. Internal Optic has been cleaned to ensure the highest possible imaging quality. Trending at $186.33eBay determines this price through a machine learned model of the product's sale prices within the last 90 days. Panasonic lcd projector pt-f300u no remote no power cord. For sale is a Panasonic PT-F300U Projector. Starts up, bulb works, etc. This Projector has been tested working onsite in our testing lab. The projector shows signs of scuffs and scratches from normal use. This is for a projector only, No Power cable, remote or other accessories included. Quantity listing with reference photo, you may not receive the actual item pictured. 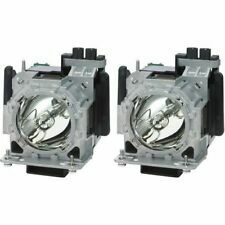 Projector lamp hours will range between 1500- 3600 total hours. Projector is on hand and ready to ship to you today. Please feel free to message us any question you may have. Thank you for checking out our listing. New open box, on-hand ready to ship. 0 hours on projector. Aspect Ratio 16:10 (WXGA). Display Technology LCD. Lens 2.00:1. Lens Shift Horz & Vert. Unit Weight 13.7 lbs. Contrast Ratio 600:1. H Sync 15.0 - 91.0kHz. Digital Keystone Vertical. 328 dB (Silent Mode), 33 dB (Normal/Eco Mode). Operation noise. 5 x 19 3/8˝). 5 x 492 mm (19 5/8˝ x 6 5/8˝. Cabinet materialsMolded plastic. InstallationCeiling/floor, front/rear, 360-degree free installation. Panasonic L556U LCD Projector. ⦁ Projector Weight: 12.8 lb. Professionally-Refurbished Projector in Perfect/Excellent Working Condition. Internal Optic has been cleaned to ensure the highest possible imaging quality. HD Video Mode: 1080i. Panasonic PT-F200U LCD Projector. Lamp and filter have been cleaned to improve image quality and to extend projector's life. Projector Weight: 13.7 lb. "Projector has been Tested and is in Good Working Condition.". 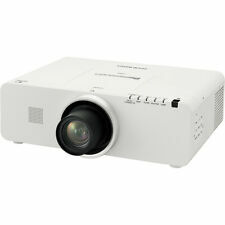 ThePanasonic PT-DZ570U WUXGA Projector is flexible and powerful enough to thrive in a variety of working conditions. It is specifically designed to deal with full-HD widescreen sources, such as from a Blu-ray player. A INTER CONNECT CABLE (15P MALE/ MALE) IS SUPPLIED ALONG WITH A POWER CORD. You may also be interested in. THE SYSTEM IS SHOWN WORKING AND NOT HOOKED UP TO A COMPUTER. Fully tested and working properly. Pics are of actual item you will receive.Does NOT include a lens. 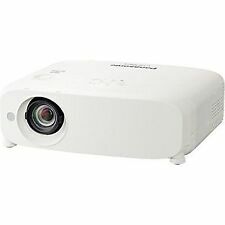 Panasonic PT-D3500U Large Venue Professional Theater Projector - 3500 Lumens! Up for sale: Panasonic PT-D3500U projector. 4.5 out of 5 stars - Panasonic PT-D3500U Large Venue Professional Theater Projector - 3500 Lumens! 3 product ratings3 product ratings - Panasonic PT-D3500U Large Venue Professional Theater Projector - 3500 Lumens! PANASONIC MODEL PT-F100NT LCD PROJECTOR W/ REMOTE. 1988 E. Alpine Ave.
• (1) - PANASONIC TKGF0160-1 STANDARD ZOOM LENS. • (1) - HDMI CABLE. Unit does NOT include a lamp bulb. We used a compatible lamp from a different unit to test and projector produces a bright and clear image. Panasonic PT-RW330U Laser/LED DLP Projector. Projector testing details Well maintained - This projector is clean inside and outside, and tested for 5 hours by us to ensure full working condition. Projector is quiet - no loud or noisy fans. Tested and working. Lamp 1 150hr Lamp 2 283hr. It has a 1.53 to 3.09:1 throw ratio with a central-lens design and other installer-friendly features to simplify setup in a variety of situations. It sports a 1280 x 800 WXGA native resolution for viewing detailed video, pictures, or data at most viewing distances. Panasonic projectors give you the ability to play your media at a much larger size than a traditional TV display. There is a bevy of options available on eBay with many different sizes and picture resolutions. You can use these reasonably priced Panasonic projectors for a wide range of applications related to both business and entertainment. What are some of the product specifications? What are some different uses for a projector? Projectors have a variety of different practical uses for both entertainment and professional purposes and are widely used in both industries. They allow you to easily display content to a large audience in a readable format. In an office setting, you can use a projector to display an important presentation to either your colleagues or clients in a conference room. Projectors are also utilized in home theaters to project movies for an audience. They can also be linked to cable boxes and other TV receivers so that you can watch your favorite show or sporting event. Projectors need to be set up so that they have a canvas to project on to. In many instances, a projection board is sized for the projector. Projectors may be mounted from the ceiling of the room that they are located in or stood up in an unobstructed location. Care should be taken to ensure that the projector is safely put in the correct location for the room it is being used inside of. Panasonic projectors come equipped with several different ports for the connection of external devices. HDMI ports may be used for high definition content. It should be noted that projectors do not produce audio, so an external sound system is necessary if sound is needed.